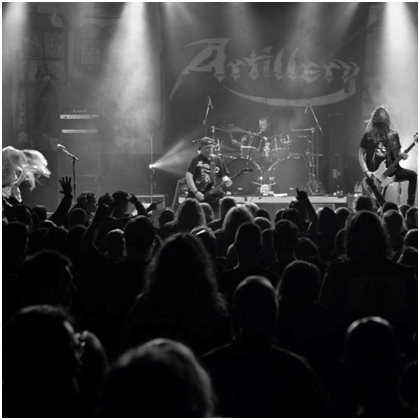 Artillery are releasing their latest album “The Face of Fear», on the 16th of November 2018. We had a chat with MICHAEL STÜTZER to get to know him a bit better, to find out if he is a cat or a dog person and how seriously he takes his morning coffee. Also, he owes us a bad joke. Michael we are looking forward to that. Where are you from originally and how does that place inspire your work? I’m from Copenhagen Denmark and being from a very small land, we did not had so many other bands to compare us with, so it helped us a lot to develop our own sound. Do you feel that as an adult, in Denmark, you get enough opportunities to express yourself creatively as an artist? Yes it’s ok but if you compare with for example Sweden they have more opportunities. Like better rehearsal studios, more money from the government to support the bands. But in general I’m satisfied. Ha that’s difficult, but if you ask the other band members they will say I tell bad jokes, but I’m not agreeing. There’s only one way to find out then. Tell us a joke. That’s tough in English, but let me think about it. I have a very Danish sense of humor I think. How would you define a deed of darkness? A deed of darkness is like a normal guy doing normal things. Like sneaking around at night and digging up dead bodies. Sounds perfectly normal to me as well. What moto do you live by? Cat person, I have a cat. I have to have my Morning Coffee. What makes you face your fears? Looking at how the world is running with overpopulation, pollution, violence and manipulation makes me face my fears. Speaking of world issues: How would you describe a utopia? Utopia is what is what you can’t reach or gain. Ok! Tell us everything we need to know about the new album that you are releasing in a couple of weeks! FOF is a record that combines catchy and powerful melodic thrash metal songs with a great production and nerve. “The Face of Fear” is the band’s 9th studio album, and the third with the current line-up. Make sure to like and follow their Facebook page, and check out their video of “The face of fear” .